Jonathan and Susan Lipp, owners of Full Compass Systems, recently attended the National Association of Music Merchants (NAMM) Advocacy Fly-In in Washington, DC. Here they joined celebrity musicians, researchers, congressional leaders and other NAMM members to press Congress on the importance of providing music education to all children. 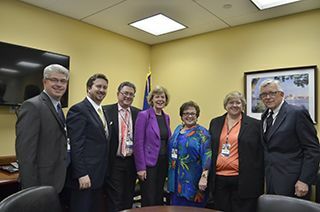 Jonathan and Susan Lipp of Full Compass Systems met with Sen. Tammy Baldwin and other NAMM members to discuss the importance of education in schools. This year’s fly-in was the largest ever, with NAMM members and artists attending more than 100 meetings with Congress to urge the reauthorization and full funding of the Elementary and Secondary Education Act (ESEA) and to continue the designation of music as a core academic subject. The Lipps are passionately committed to finding ways to facilitate funding for school music programs and to make high-quality music education accessible to students across the nation. They have also established scholarships at UW-Madison for theater and music majors and host several annual fundraisers and performance events to promote music education. Donations support local youth arts organizations and students in Madison, Wisconsin, where Full Compass Systems is headquartered. NAMM is a not-for-profit organization acting on behalf of the music products industry to ensure people of all ages have opportunities to experience the pleasures and benefits of making music. NAMM is also an invaluable resource for information about new, innovative technologies related to music performance and production. The organization was established in 1901 and is supported by over 9,000 members from over 100 countries.